A big colourful clock that's simple to read and has nice big hands that are easy to turn. It also comes with activity cards so you can show children what they would normally be doing at each time of the day. 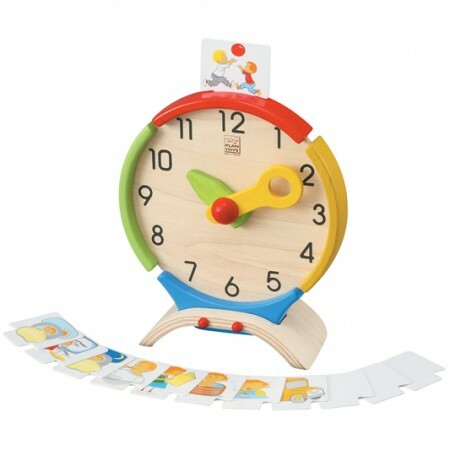 9 Cards show activities such as having breakfast and sleeping and they can be slotted into the top of the clock. Looks great on the toy shelf and is a greast way to help chidlren to learn to tell the time. Sustainable wooden toys from Plan Toys are made from recycled rubber wood that would otherwise be burned. Proudly made in Thailand with a strong emphasis on fair trade working conditions, eco friendly practices and investing in the local community.